Wow. This situation in the Arctic is unprecedented. Really, that speaks for itself. Ned, I find these graphs confusing in that they're not at all confusing. I want you to drop everything in your hands and come right over to me and hold me in the hand while you explain how you were able to make them so non–confusing. This needs to happen immediately. The graph title explains it all! Well, along with the axis titles. I had some difficulty choosing a map projection for the continents on the map. I finally found a good one, though. Ned, I found an error in your graph that actually is confusing: There is no Feb 31st. February being a sort of saldation month only has 28 days. On rare occasions it may have 29. Never 31. There's also a lack of proper titles for the charts. However funny, they need to abide by University standards, otherwise you'll have trolls camping in your backyard. — No, thanks, I'd rather have single–malt with a 15% ice coverage. 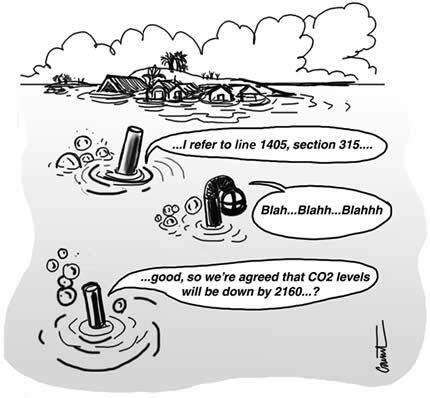 I collect AGW cartoons that I think are funny. Let me know if you want more. I love that last one, with Batman. For any Canadians this is funny. To let the rest of you somewhat understand the joke. Tim Hortons is Canada's #1 (by a very wide margin) coffee/donut chain and sell Timbits which is the centre of the donut. Also we do have a couple of small subs that may or may not be working at this time. As a geologist, I like the trilobite one! The one with the slip was posted by Neven some time ago. From Sigmetnow's 'Places becoming less livable' post on March 19, 2015. The batch of the day. Edit: still cannot seem to embed /share youtube. Is pretty good to see in any case. Did I say I still have a few left? Maybe not that funny, but nicely drawn. But these are funny. My, what a thread this has become. Clever. Ripping a new one using temperature data.